The world’s largest cities are also home to industrious rat populations. One notable example is the “Pizza Rat” video, where an ambitious New York City rat drags an entire slice of pizza with him down a flight of subway stairs. Over the next three years, “Pizza Rat” accumulated 10.4 million views and turned into a popular meme. Even destructive animals like rats can become familiar and entertaining when you live alongside them a while. But why are city rats so hardy and enduring in such a seemingly harsh environment? Rats as young as five weeks old can have large litters of 8-12 ‘pups’ every 8 weeks, so the population grows very quickly. Rats are nimble. Brick walls, wires, and laundry lines are all climbable for a rat. They also take advantage of all the nooks and crannies city architecture offers, a kind of protection that rural wild rats don’t always have. No spot is out of reach for them, so this is where rats become truly destructive animals in cities. Fun fact: Although a larger percentage of the rat population dies in rural areas due to higher numbers of predators, those who do live in rural areas tend to live longer on average compared to city rats. City rats have easy access to a huge amount of food compared to their country cousins, but the majority of it is city trash. Think Pizza Rat found a nutritionally complete meal in that piece of old pizza? Not likely. Rats are extremely clever and empathetic animals. 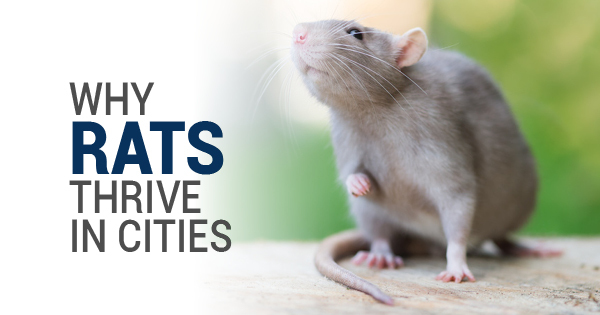 That’s what makes domesticated fancy rats popular as pets. Wild brown rats are as clever as their domesticated cousins. Rats will taste test bits of new food to check for ill effects, making a lot of traditional poisons ineffective. They’ll also attempt to free another rat that is trapped in humane rodent control traps, even foregoing nearby food to help their fellow rat. Unfortunately, the estimated NYC rat population of 2 million is just not sustainable. Even professional rodent removal groups in cities are having a terrible time removing the unwanted rodents. The only effective solution so far? Improving public sanitation to cut back on the rat’s favorite abundant food source, garbage. We’ll see how the NYC trash experiment goes toward the end of 2018, but for now, homeowners in suburbs can also prevent rat infestations with good trash management.